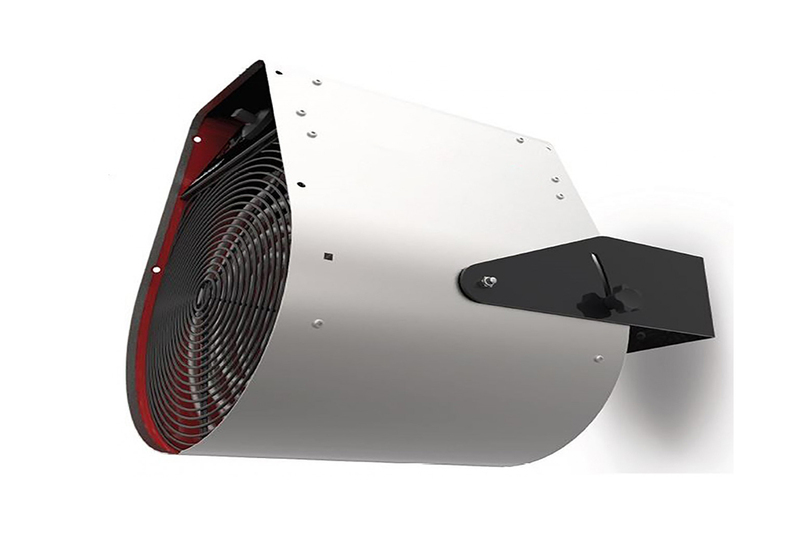 Electric Unit Heater – The FHSH electric unit heater range of low noise,efficient fan heaters for fixed installation of larger areas are suitable for heating, drying and /or ventilation of larger areas. 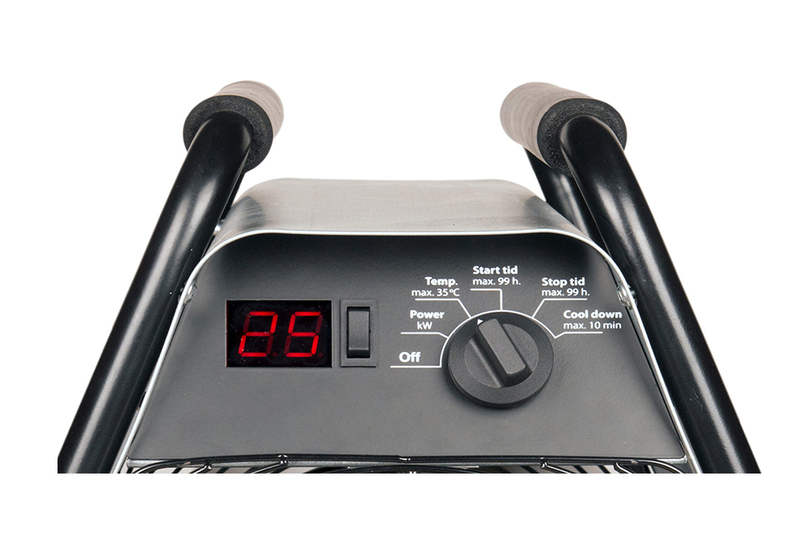 The heat output and fan speed is set via the control panel on this range of electric unit heaters. The adjustable wall mounting brackets allow the air stream to be directed to suit the site conditions. All of these electric unit heaters are made of corrosion proof housing of white powder coated steel panels, and are the perfect solution for your commercial or industrial electric heating needs. The FHSH 6kW to 15 kW Electric unit heaters are not intended for use other than indoors and are only to be wall mounted and for this reason some people refer to them as wall mounted electric blow heaters, for ceiling mounted units that can blow the warm air down vertically , please see our “FHTHERM-E Range” , detailed at the bottom of the page .These electric unit heaters are appropriate for the heating of warehouses, workshops, storage rooms, show rooms, etc. Installation time and costs are minimized when using our electric unit heaters as they are compact and completely factory wired, the unit heater only requires only a power supply connection to the heater. These units come with a control box, which should be mounted at point that gives easy access to the operator of the electric fan heaters. Several electric unit heaters may be control via one control box if so required.The controller makes it possible to control the 3 fan speeds and the 2 heat levels of the electric unit heaters. We supply as standard the wall mounting bracket and a controller , as a total package for these electric unit heaters, making them ideal solution as an electric unit heater for a garage or car workshops. The air is carried through the heater by a fan and heated by non-corrosive elements which are regulated by the built in thermostat with at range of +5 to +35°C. The air speed is adjustable in three steps. Switching on or off, selecting half or full output and regulating the RPM is performed through the control box , which is wall mounted for easy access. The appliance is protected from overheating via a built-in temperature limiter. Ensure that the area around the intake and the exhaust grille is kept free from material which could prevent the air flow through the appliance. The electric unit heater has hot surfaces during operation.The heater must not be covered either with clothes or similar material since overheating of the appliance can result in a fire hazard. Our electric unit heaters operate reliably when installed and operated as directed. In addition to meeting all requirements of the electrical standards , the heating element is backed with a two year warranty. The “FHSH” Electric Unit Heaters are a great and inexpensive heating solution for garages,workshops, stores, sports and entrance halls, businesses, assembly and storage facilities, in churches and also in damp areas ( due to the IP44 electrical rating ). There are models with 6kW, 9kW, 12kW or 15 kW Outputs available within this range of warm air electric unit heaters. Corrosion resistant – The Housing is manufactured in galvanized sheet steel,then powdered coated layers applied in an asthmatically pleasing white finish. Air flow through the three Speed levels can be tailored to the room / area conditions. 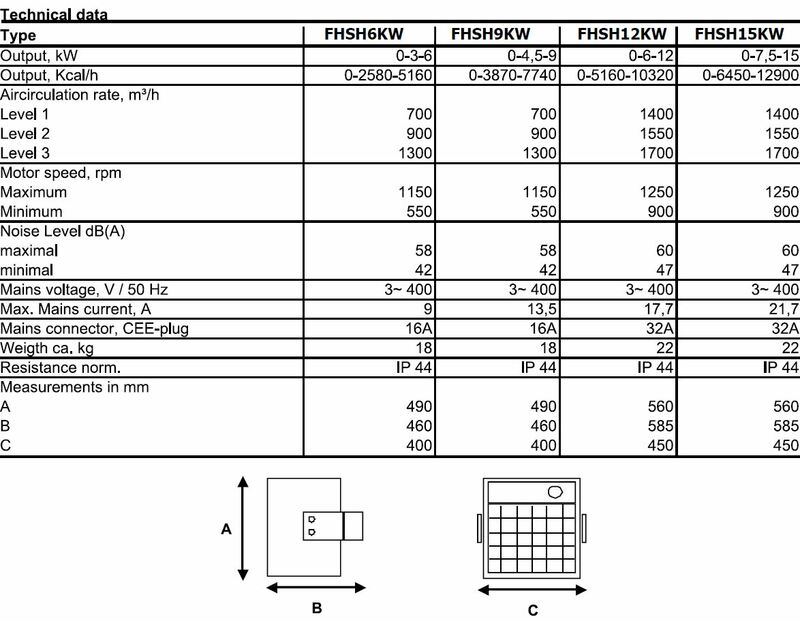 All of the FHSH Electric unit heaters are rated to IP44. This IP rating is made of up of two components , the first digit gives the level of protection that the enclosure provides against access to hazardous parts (e.g.- moving parts, electrical conductors,etc) and the ingress of solid foreign objects – for our electric units heaters this is 4 – and means that tools, wires, screws etc larger than 1mm are protected against . The second digit of the IP rating relates to the protection of the equipment inside the enclosure against the harmful ingress of water- This again is 4 for our electric unit heaters – and means that water splashing against the enclosure from any direction shall have no harmful effect. Thus IP44 means that the electric unit heater is protected from tools and small wires greater than 1 millimeter and protected from water spray from any direction. Delay start -Programmable On feature – This feature enables the user to postpone the starting time of the electric unit heater by up to 99 hours. Delay stop – Programmable Off feature – This feature enables the user to extend the operation of the electric unit heater by up to 99 hours. Digital Temperature Control – The heater can automatically control the room temperature up to a maximum of 35 Degrees C. The heater will automatically come on , if the room temperature falls under the desired temperature you select ( up to and including 35 Degrees C) , the heater automatically switches off when that temperature is achieved. These electric unit heaters are only to be mounted on a wall, and can’t be suspended from the ceiling. 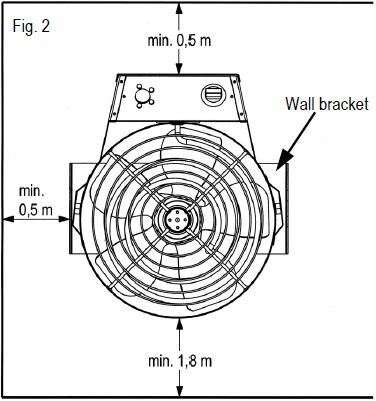 They also require the following clearance to the electric wall mounted heater to function safely and properly. We also do a stainless steel cased Electric Unit Heater , which has an IP54 rating for electrical protection , and has a maximum output of 9 KW . 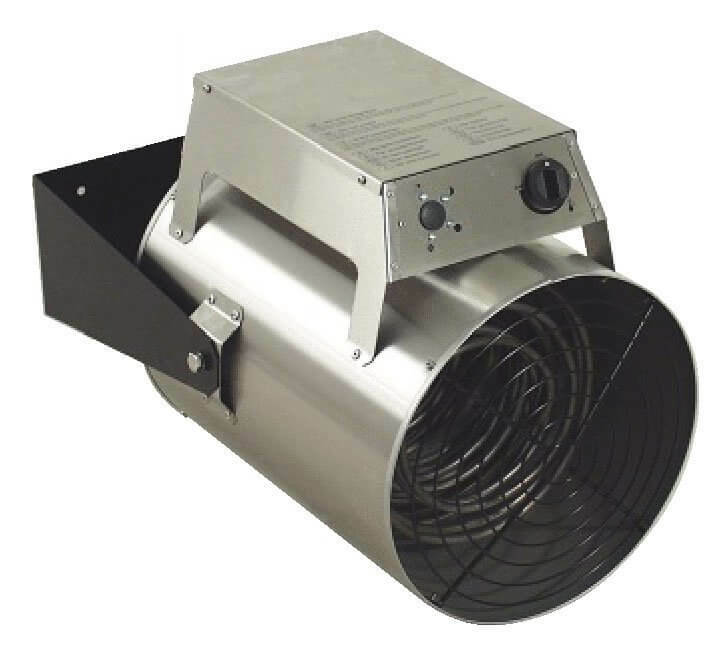 This electric unit heater is particularity suited to heating farm buildings etc, where IP54 is a requirement or in any damp or humid areas .It is also used in dry environments such as in commercial buildings, warehouses, workshops and other places where the IP54 protection standard is required or any other applications where a fire hazard is of particular concern.The Stainless steel housing and the heating elements are made of stainless steel 316H ( this stainless steel grade has excellent corrosion resistance when exposed to a range of corrosive environments and media. 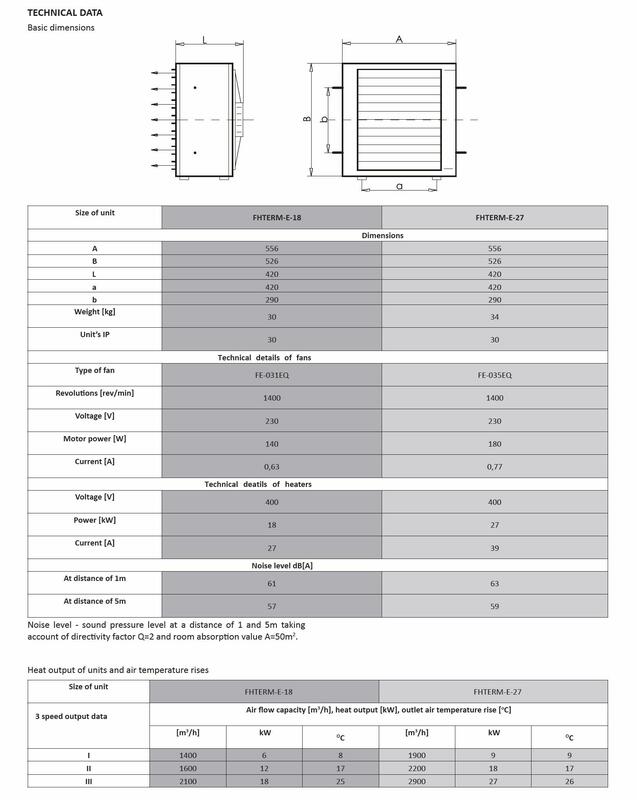 It is usually regarded as “marine grade” stainless steel but is not resistant to warm sea water) and the IP54 rating provide an increased resistance to destructive dust,and water drops falling at any angle as well as aggressive gases which can cause accelerated corrosion to a non stainless steel cased electric unit heater. This 9 kW commercial or industrial electric unit heater has an inbuilt room thermostat to control the temperature and automatic protection against overheating.The step-less variable thermostat and accurately sized fan ensures an even temperature and good heat distribution.These industrial fan heaters can be controlled to give a 1.8 kW , 5.4 kW or 9 kW heat output as a three phase heater and has an inbuilt adjustable thermostat working in the temperature range from 0-40 ° C . It is also prepared for connecting an external thermostat if so required and can be used in a fan only operation to.They also make a perfect electric unit heater for a garage or workshop heating application. 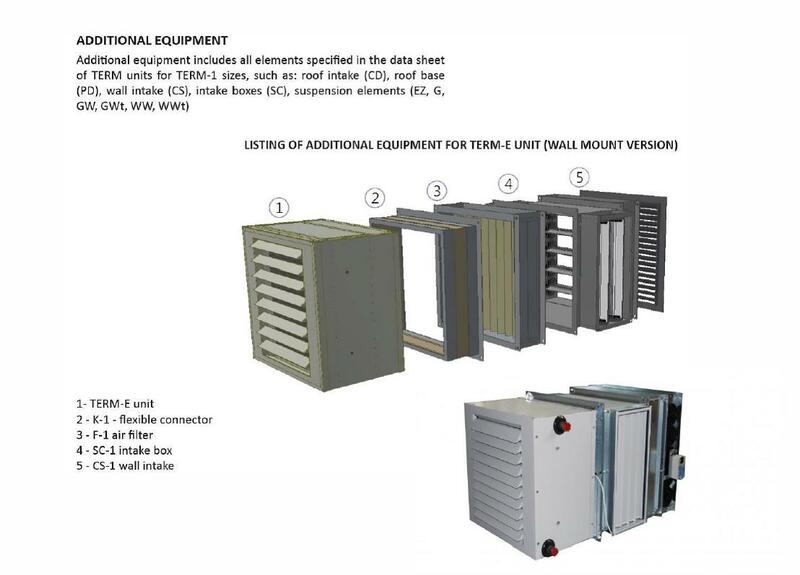 These two options that are available for ceiling mounted electric unit heaters are shown below – to the right of the standard single row distribution grid, which the units come as default. NB – The maximum height at which you can mount these warm air electric unit heaters when using the slot diffuser is 4 metres .The discharge cone can also be fitted to the wall mounted industrial fan heater, to give it a larger air throw, if so required. 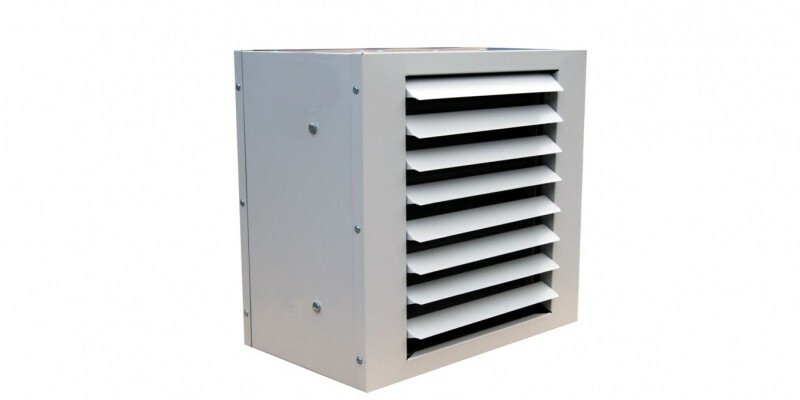 We also supply a full range of additional accessories, which allow you to mix a proportion of fresh air and recirculated air through the heaters, either via an external wall or a roof intake.